How will the idea benefit members and their financial well-being? Does the idea create a positive financial impact for the credit union? Can the idea benefit the credit union industry? 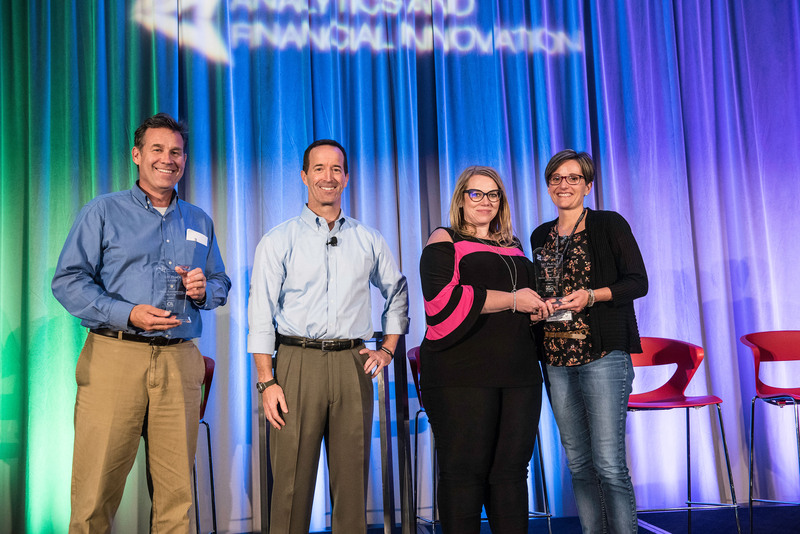 The three finalists that presented their work at the 2018 Analytics Digital Transformation Showcase included: Cornerstone Credit Union, Ohio Healthcare Federal Credit Union, and Our Community Credit Union (OCCU). Cornerstone Credit Union was selected by the panel of expert judges as the winner of the Analytics Showcase competition. In collaboration with Celero Solutions, Cornerstone Credit Union has developed a set of insights using the OnApproach M360 Data Mart. Their goal is to bring all their data sources together into a single environment and provide their staff with pro-active, actionable business insights about the member’s they serve. With this goal in mind, they created a Member 360 Dashboard to provide their advisors with a summary of each members’ relationship with the credit union. Not only does the dashboard provide a single page view of a member, it also helps their staff uncover opportunities that will strengthen relationships. By using predictive analytics, dashboard users can identify which members are at risk of closing their membership and which product(s) a member is likely to purchase next. At a glance, dashboard users can see when a member is actively engaged with our credit union or when a member banks elsewhere. The Innovation Showcase finalists included Tethr on behalf of BCU, Best Innovation Group, and Digital Recognition Network (DRN) on behalf of Philadelphia Federal Credit Union. Tethr’s presentation on BCU’s utilization of service center member call data was selected as the winner of the Innovation Showcase competition. Despite the growth of digital channels at BCU (and credit unions across the country), many members still prefer to call, rather than self-serve, which results in millions of valuable but uncaptured data points, which aren’t being leveraged for analytics. Members are providing valuable feedback, which the credit union is missing to offer new products and increase member experience. According to Dave Shelpuk, Senior Sales Executive, Tethr, “The problem is not the growth of the digital channels… [there are] 2.7 Billion Tweets per day from Twitter, but that is very very small in comparison to the current spoken word channel which on a daily basis is almost half a trillion words spoken. And of that, only 1% of those calls are ever analyzed or acted upon.” BCU utilized Tethr to apply machine learning to call center data for improved analytical opportunities, resulting in a 56% reduction in time it took staff to derive insights from call center analytics, while increasing member, process and agent insights by over 300%, without adding any FTEs to the staff. BCU also experienced a 10% increase to first call resolution, a 5% increase in member education of self-service products, and they are now better able to identify and prioritize top causes for member contact/re-contact, drivers for increased agent handle time, and factors driving member churn. The Analytics and Financial Innovation (AXFI) Conference provides a forum for credit unions, industry experts, and service providers to discuss industry trends and provide tangible insights to prepare your credit union for the future. The AXFI Conference features three tracks to pick from, Analytics, Innovation, and Cybersecurity, and features distinguished speakers from across the industries of financial services and data analytics. This conference is designed to be of interest to all levels of credit union management, C-Level, VPs, Managers and Technical Staff. There is something for everyone.